This dialog implement the SavaPage Web Print function, and is shown after a tap on the Upload button in the footer of the main panel. Font for plain text: change the font when you upload a plain text file (TXT) that contains characters not supported by the Default font, like CJK. Use Unifont when the source text has a real broad Unicode coverage. Choose Files to be uploaded. Beware that the actual file selection button differs from browser to browser. Press the Upload button to start the upload. The status of the upload will be displayed below the selected file name. The Reset button clears the status messages and selected file. The “garbage bin” button shows the number of (uploaded) documents currently present in the SafePages inbox. When you press this button, all documents will be deleted, and the button hided (until the inbox is filled again). 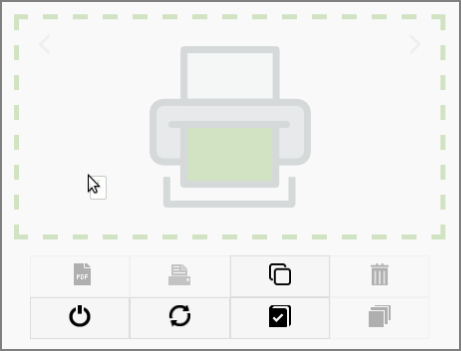 After the upload, use the Back, Print or PDF buttons to navigate to the next step. A comma or space separated list of file extensions (without leading point), that are excluded for Web Print. For example: rtf,html,ps,txt. 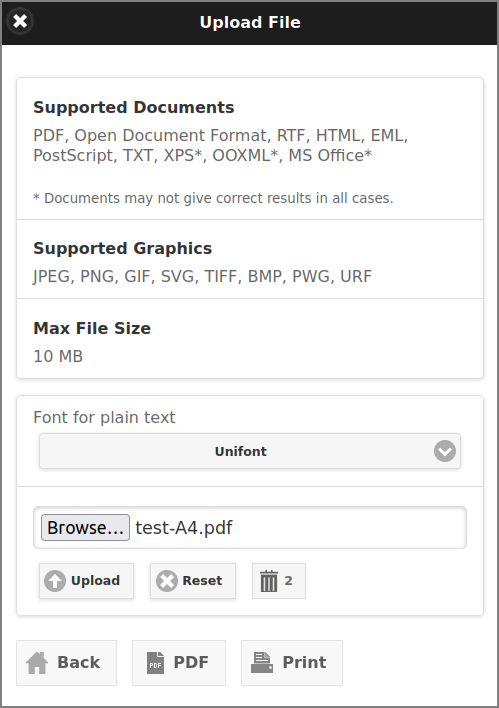 When TXT file type is excluded, the Font for plain text selection in Upload File dialog is removed. See Section 4.10.14.11, “Config Editor” on how to set these items. For uploaded file types that do not have a page size defined (HTML, TXT) the default paper size is used. For image files the graphic involved is a best fit on the default paper size. The Upload Dialog and thumbnail area of the main view can act as Web Print Drop Zone. You can (multiple) select files in any desktop application and drag & drop them into the zone, after which they are immediately uploaded. When files are dragged into the zone, it lights up with a green border. The Drop Zone can be enabled at Section 4.10.8, “Web Print”. 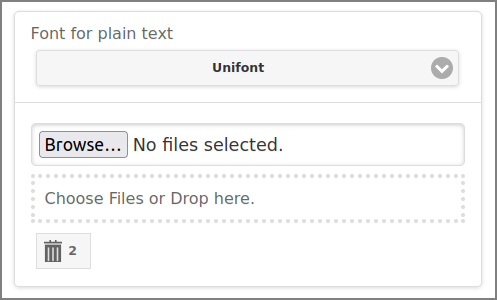 For plain text files dropped in the Main Drop Zone, the selected font in the Upload Dialog is used.